On May 13th, songwriter/producer Mischke revealed on Twitter that he spent the previous working with Gwen Stefani on some new music. Wow, I got to work with the great @gwenstefani last week. What a blast. The only two things that we were talking about putting out last year were Kendrick and Gwen. Kendrick of course came out this year, and Gwen is still working on her album. But that’s kind of the nature of the business. When the creative process is at work, you don’t want to force something that’s not ready. Both Gwen and Kendrick are people you know you can trust with that process—only they know when it’s done… Gwen is hard it work on making sure everything is coming together the way she envisions it. It was later announced that Gwen will be returning to The Voice for the fall 2015 season; will Gwen try to do what she failed to do in 2014, and release her album at the end of this year? If The Voice gives her good hype, it would be wise for her to release in late 2015. You can buy “Kings Never Die” from the Southpaw soundtrack on iTunes now. While the two of us have come to the mutual decision that we will no longer be partners in marriage, we remain partners in parenthood and are committed to jointly raising our three sons in a happy and healthy environment. Gwen has written about their marital struggles over the years, and now that they have separated, it is likely that the divorce will inspire some personal new songs. It will be interesting to hear if this is reflected on Gwen’s new album. I have close to ten songs, which doesn’t sound like a lot, but it’s over a very short amount of time. It’s never happened. So I am in a really good place for writing and I think that has a lot to do with being on the show last season and also just, I don’t know, just opening up and being on a journey to get to this point to be able to write again. I have never been in a place, where I’m like outside all my life, where all I want to do is get in the studio. It was always like a chore, like “Oh no I have to go to the studio, I am not going to be able to do it. What am I going to say?” Like it’s an opposite, it’s like I gotta get in the studio. When is there time, you know? Every time I go, I know I’m going to have a song and every time I have a song I get to play it really loud in my car and it’s really fun. Were the 2014 songs scrapped? Is Gwen starting over on her solo album? Or will her 10 new songs be added to her pre-existing batch of songs? And if the breakup has been a big inspiration for Gwen, could the new songs lean towards the Tragic Kingdom and Return Of Saturnsound of No Doubt’s middle years? On September 16th, Entertainment Tonight published a new interview with Gwen, and she spoke about her third solo album. As she stated, “I’m always in a rush. I want to get music out always and as soon as possible. I have never had a writing experience like this. This has been literally channeling unbelievable luck.” Gwen went on to reveal that she has 15 new songs, not including the previous one she worked on in 2014. I went in and I found these kids – these writers and these producers – it’s a group of us, I call ourselves The Breakfast Club. I have 15 songs, or probably more than that. I do have more than that because I have a bunch from before but the ones that I’m really addicted to that I’m like, ‘OK, these are the ones.’ It feels so good and it’s been incredible. Apparently Gwen was thoroughly inspired and motivated, because she continued to excitedly share studio updates on Instagram. Gwen has been working with Justin Tranter, Mattias Larsson and Robin Fredriksson, Julia Michaels, and Aaron Bay-Schuck. On Saturday, October 17th, Gwen surprised fans at a concert in New York by performing a brand new song. It was inspired by her recent divorce with Gavin Rossdale, and the title says it all: “Used To Love You” describes Gwen’s long relationship with Gavin and the mixed feelings she has now that it’s all ending. During the concert, Gwen said that “Used To Love You” was most likely going to be her new single. It didn’t feel right. I didn’t feel fulfilled. That record with Benny was done that way because I had just given birth and had just started on The Voice and felt like I should do something in music, but what was I going to do? There wasn’t enough time. So I tried to make a record where I was just kind of involved — which is how a lot of people do it, but it didn’t work for me. Meanwhile, Gwen’s personal life was facing major changes. Gwen and Gavin have been together since the ’90s, and married in 2002 before having three sons together. Unfortunately, their relationship went sour somewhere along the way, and their divorce has left Gwen filled with songs she needs to get out. I needed to go through what I needed to go through to write the record that I needed to write. There was a lot of prayer and meditating in the sense of trying to be open and grateful with this record. These songs are really natural — they’re from not worrying about what happened or what’s going to happen but about living in the moment, from trying to be present and trying to feel. Though the writing process in No Doubt is often slow, as Gwen takes her time writing meaningful songs, this time was different. Instead, she had a lot to get out, and it poured out of her quickly. It happened really fast. I just feel so lucky to make music. It’s a gift to channel true emotions and then capture them. When I finish a song I listen to it so many times — until I can’t listen again — because you learn things about yourself that you didn’t even know you were saying, or needed to say. “Used To Love You” definitely says things Gwen needed to say. It’s just the first new song of what will likely be a very confessional, emotional album. In an interview with Yahoo, Gwen revealed that her new album will probably be out next year. “Used To Love You” is available on iTunes now. On November 2nd, Gwen had a couple of interviews in which she revealed a lot about her new solo music. She had an interview with Carson Daly on 97.1 AMP Radio and a longer interview with Zane Lowe for Beats 1. Gwen confirmed that the material she worked on in 2014 didn’t feel authentic. She was not satisfied with the songs and felt fake. Gwen wrote with many top-notch songwriters – Sia, Charli XCX, Benny Blanco, Ryan Tedder, Pharrell – but her own involvement was minimal. She didn’t feel confident or inspired to write, but soon discovered that this popular songwriting method wouldn’t work for her either. So she waited until she was inspired to write in summer 2015. This time, the songs have been pouring out of her. Between the two interviews, Gwen revealed six new song titles: She wrote “You Don’t Know Me”to piano with Rick Nowels. As Gwen describes it, that was “the first opening of the channel” of her songwriting inspiration, and a hint that this record could really happen. She felt like she really could write good songs about what she was going through. 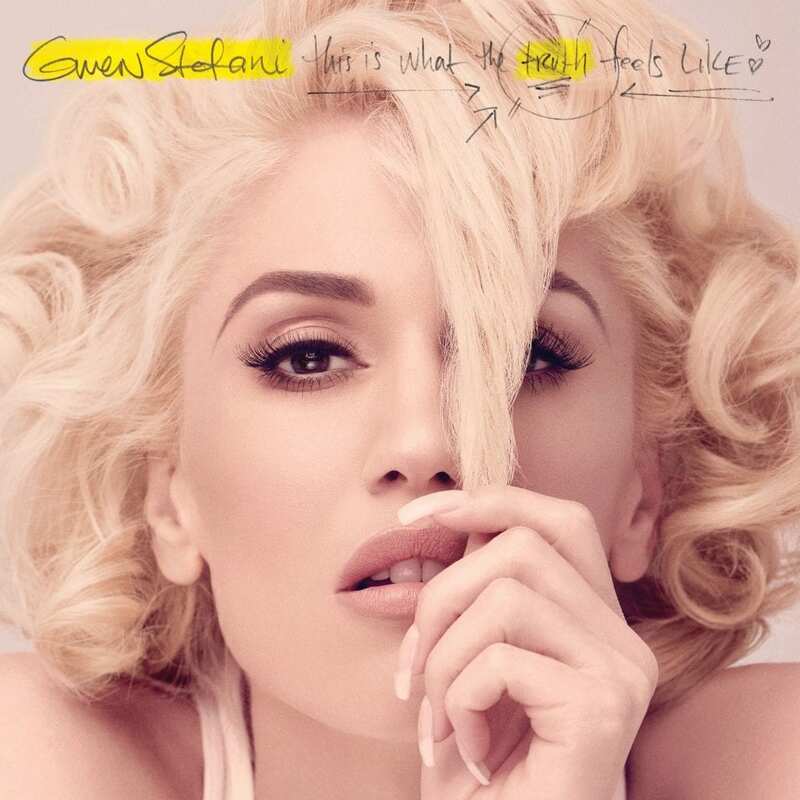 They also wrote a song called “Make Me Like You,” and that led to another idea for Gwen. The next day, they wrote happier song called “Misery,” which Gwen thinks may be the second single for her new album. Gwen has written about 15 songs with the Breakfast Club, and around 25 new songs total. Gwen said that most of her many songs came to her within 8 weeks of working on the album, starting in June. Understandably, Gwen has been going through a roller coaster of emotions, and that is reflected in the new music. She described how the songs she wrote earlier this summer were more sarcastic, dark humor, but then her style became more serious. Her more recent songs sound more joyful. At this point, she has over 25 songs and enough material for two albums, though she wants to keep writing since she still has so much inspiration. Gwen expects the album will be out early next year.